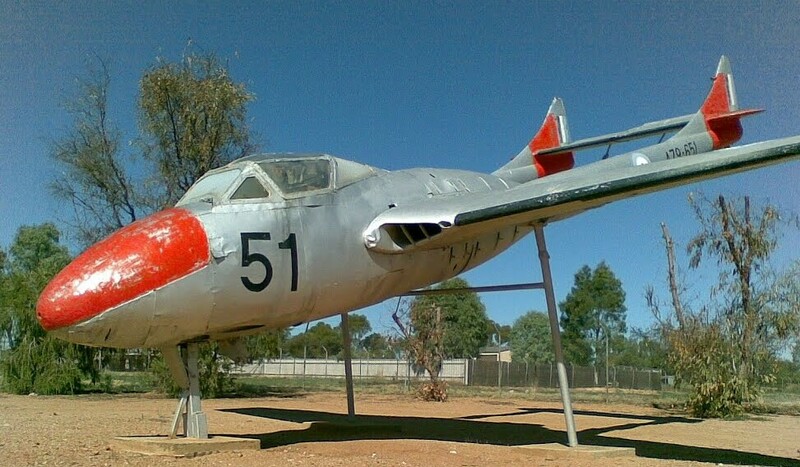 Ex RAAF Vampire Jet Trainer. Visit the Beverley Aeronautical Museum. Beverley was one of the first areas in Western Australia opened for agriculture after a glowing report to Governor Stirling by Ensign Dale. Dale made three excursions to the York/Beverley area, the first in 1829 and the last in 1830 when he was accompanied by Governor Stirling. Large tracts of land were taken up following the Governor’s excursion and the first in the district was taken up by the Colonial Surgeon, Dr. Charles Simmons.Dr. Simmons was granted some 2,850 hectares on the Eastern bank of the Avon River in January 1831 and it is a common belief that the town was named after Beverley in Yorkshire which was Dr. Simmon’s home. Official survey of the district took place in 1843. The town-site was established around 1868 and it’s status was enhanced with the extension of the electric telegraph from York in 1877. The Beverley Road District was one of the nineteen local authorities established in 1871 under the Municipalities and Roads District Act. The original Road District was in excess of 150,000 square kilometres and included the present Shires of Beverley, Brookton, Quairading, Bruce Rock, Corrigin, Pingelly, Narembeen, Kondinin, Dundas and a portion of Cuballing, Wickepin Wandering and Kulin. On the 31st. March 1892, the town-site became a separate municipality under the name of “The Burgesses of the Town of Beverley”. Shortly thereafter in October 1895, an East Beverley organisation known as the Farmers and Settlers Association successfully petitioned to create the East Beverley Road Board. These small localities were short lived, with the East Beverley Road Board dissolving in 1906 after eleven years and the Burgesses of the Town of Beverley following the same fate in 1913, after only twenty one years. Both were absorbed back into the Beverley Road Board. The change of name to the Shire of Beverley occurred in 1961. In 1886, the Southern rail link from Perth was extended to to the town, which was the terminus for three years until the connection to Albany was established. A pipeline to connect the town with the Goldfields water supply scheme was completed in 1908 and the first powerhouse to generate electricity for the town was established under private ownership in 1913. These large salt lakes are about 32 kilometres south east of Beverley and are an interesting example of the ancient geological structure of Western Australia. The lakes drain water from as far away as Southern Cross, over 300 kilometres to the east and are at times full of saline water. Yenyening Lakes are a haven for bird life and are also used for water sports.